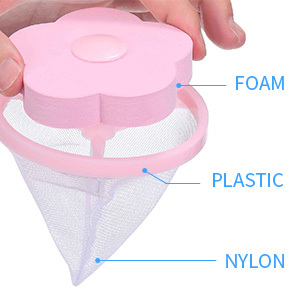 The revolutionary hair remover filters and collectshair & dirt during laundry as the residues flows and be trapped into the inverted cone shaped net bag. As the washing machine swivels to clean & rinse items, dirt in washing items flows on the surface of the gyre. Laundry Dirt & Pet Hair Remover features ultra-lightweight construction that flows and catches annoying hair & residues flown-up, thanks to the inverted cone shape design to trap dirt.